Defending champ Blue Devils score three goals in final two minutes to send the game to overtime. LEWISTON — The defending state champs weren’t going down without a fight. Lewiston did get down, yes, but they weren’t out. 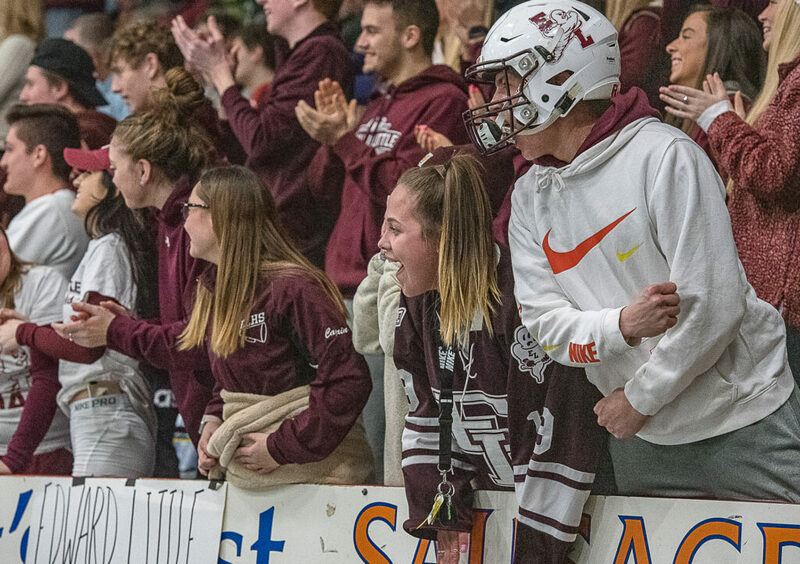 The Blue Devils scored three goals in the final two minutes of regulation, then Ridge Field scored the game-winner in overtime to lift top-seeded Lewiston to a 6-5 overtime victory over fourth-seeded Edward Little in a Class A North boys hockey semifinal at Androscoggin Bank Colisee on Saturday. Field finished off an initial attempt from John Mathon that deflected to Field 2:40 into the extra session to complete the improbable comeback. “You know, I just decided to go in front of the net, and I knew (John) had a hell of a shot, so he ended up putting it to the front and I went five-hole,” Field said. “We’ve come back many times this year, and we just know not to give up,” Field added. Ben Cassidy scored twice in the third period to give the Red Eddies (13-7) a 5-2 lead with 7:36 left in regulation. 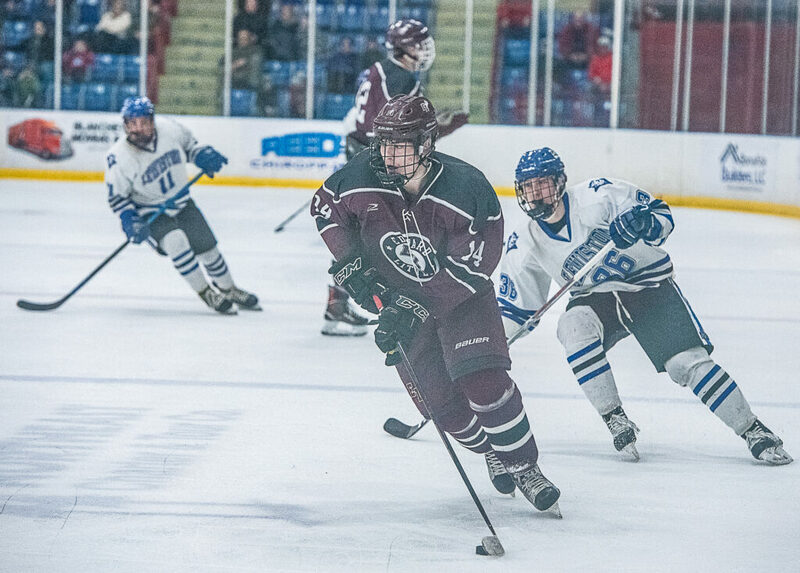 Cassidy had four goals and a secondary assist in the game. “You never thought you’d be up three goals,” EL coach Norm Gagne said. It wasn’t until the Red Eddies began parading into the penalty box that the Blue Devils (17-2) started their rally. 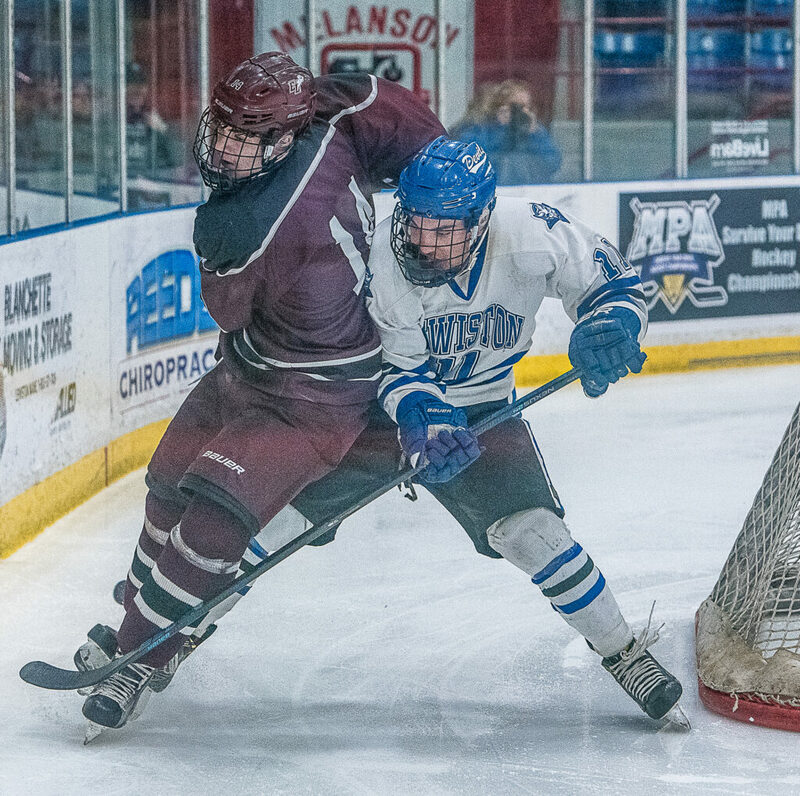 A two-man advantage turned into a 6-on-3 chance for Lewiston when head coach Jamie Belleau pulled goalie Jacob Smith. The plan worked when Ben St. Laurent scored from Kurtis Pelletier with 1:53 left. Ryan Pomerleau made it a 5-4 game 24 seconds later with a 5-on-4 power-play goal. 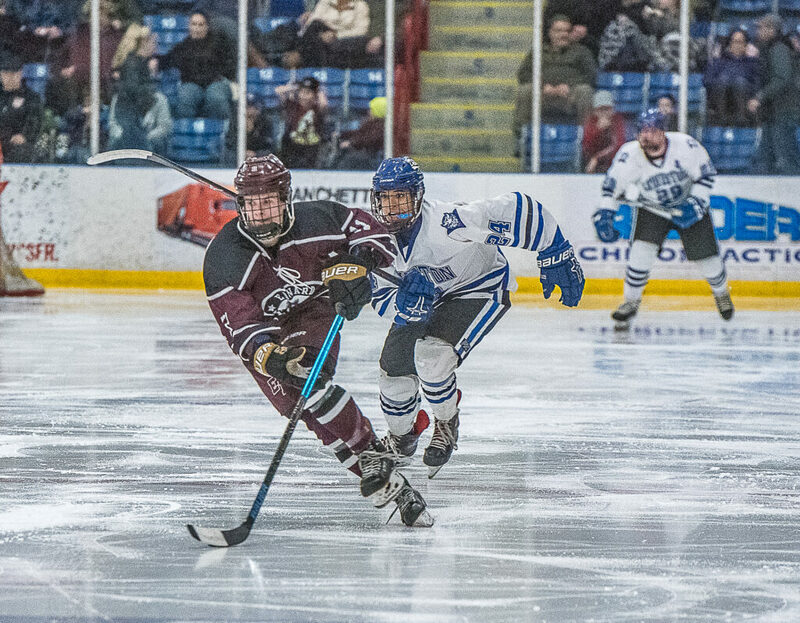 Nick Pomerleau and St. Laurent had the assists. Gagne called a timeout with 44.1 seconds left and his team hanging on for dear life. 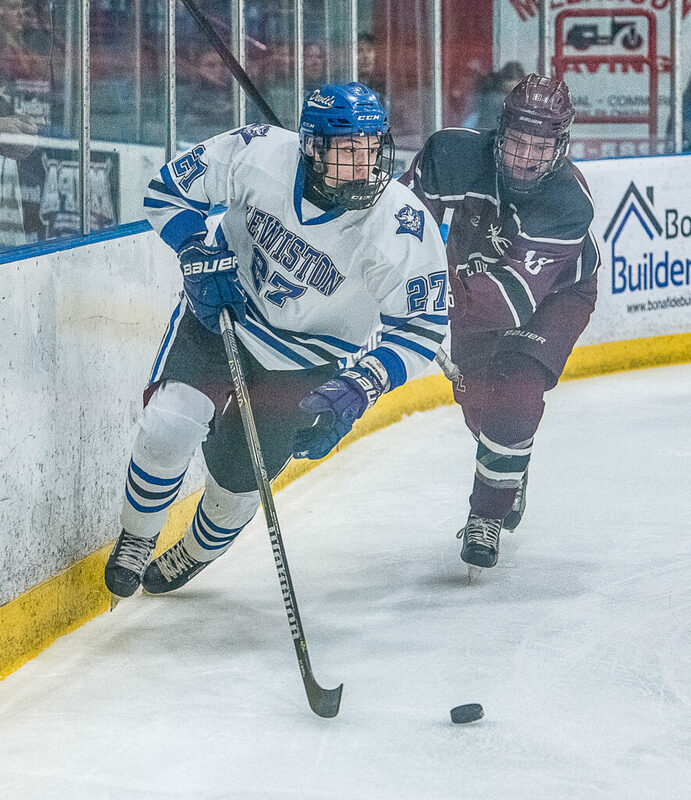 The Blue Devils won the offensive-zone faceoff, and the puck cycled around to freshman Damon Bossie, whose point shot went through an opening in the defense and got past EL goalie Devon D’Auteuil with 37.9 seconds remaining in regulation. Pelletier started the game’s scoring less than five minutes in, but Cassidy tied it late in the first period. 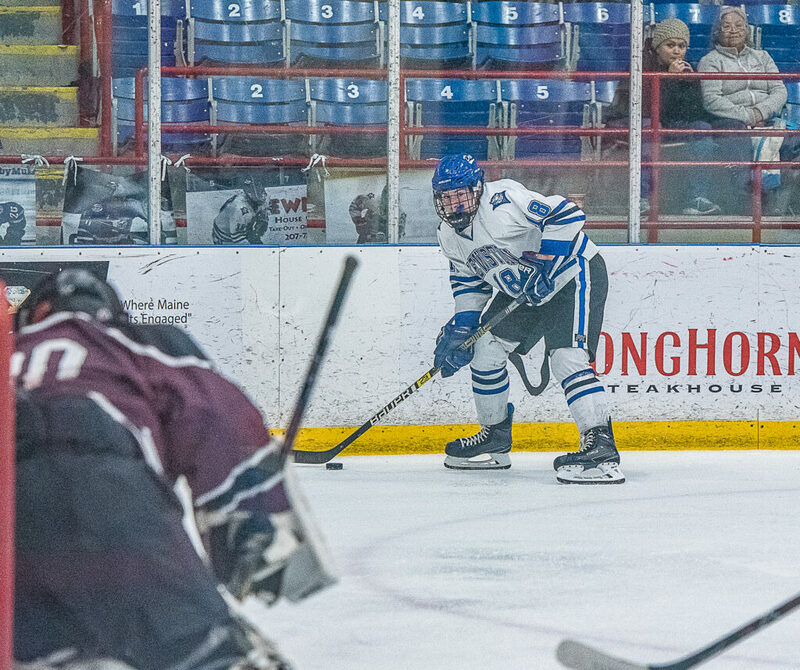 Field gave the Blue Devils the lead back early in the second, but Logan Alexander and Cassidy assisted on Cam Sturgis’s power-play goal to tie it, then Cassidy scored his second goal 17 seconds after that to put EL up 3-2. Smith finished with 20 saves, and D’Auteuil 23 for EL. The Blue Devils are now headed to their fifth straight regional final, where they’ll meet rival St. Dominic Academy — the No. 2 seed — for the second year in a row.